Hunter Valentine has been a band for quite some time now, but it seems that 2014 may be the year the band becomes a household name. At first glance, yes, many would automatically characterize them into the lame category of “all-girl rock band,” but based off of meeting them once, I could immediately tell they were much more than that. In 2012, the band was documented on tour in part of a Showtime series entitled The Real L Word and followed it up by hitting the road with the legend Cyndi Lauper. The Huffington Post refers to the band in headlines as a “Lesbian Rock Band,” although I find that just as cliche and tired as taking the all-girl angle. The band has pride and supports the LGBT community, they are all female, but they are also a cool band with incredibly charismatic and friendly personalities. 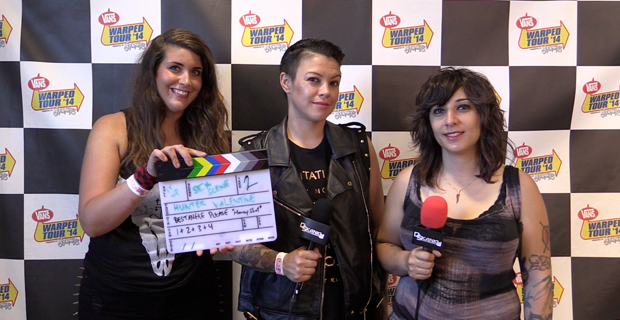 Check below the jump to see UTG TV meet Hunter Valentine for the first time as we discuss playing the Shira Girl stage at Warped Tour, their Tinder use, and to hear about the new Vh1 show they are currently starring in, entitled Make Or Break: The Linda Perry Project. Make Or Break: The Linda Perry Project is on Wednesdays at 10 PM EST on Vh1. Special thanks for additional help by Jenn Curtis Photography.